Flatbush Avenue is home to a cool cultural space dedicated to preserving and showcasing Caribbean heritage. The CaribBeing House, as it’s cleverly titled, is the brainchild of Shelley Worrell, a Trinidadian American and life-long resident of the neighborhood. The space lies inside a red trailer situated in the Flatbush Caton Market, a place where local merchants in Flatbush have sold their goods for over a decade. While the market itself has multiple booths with vendors selling items such as West Indian jewelry, flags, food and skincare products, CaribBeing House has a more modern and artsty vibe. To the right of a plank leading to the entrance is a square wooden sign that says “Be social.” Inside, a blue neon light that says “I am CaribBeing” hangs against the wooden wall. There is pop art with symbols that represent Caribbean and New York culture. There are also tote bags emblazoned with the CaribBeing logo and more art work for purchase and a giant sheet in the back for visitors to sign. CaribBeing House offers the annual Flatbush Film Festival, art exhibitions, different types of cultural presentations, artist talks, dance performances, trunk shows. “The space is going to be constantly changing and we could even have a dinner party here if we wanted, so the whole concept is that the space will continue to evolve overtime,” said Worrell, who conceived of the organization in 1999 while studying at Brooklyn College. 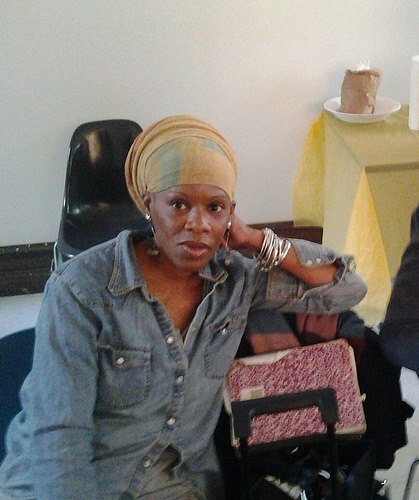 Worrell was born three blocks from the market and has lived in Flatbush for most of her life. It was not too far away, at the library on Linden Boulevard, that the organization began to take shape. “I think that’s another reason why I wanted to have a presence here,” she said. “We started CaribBeing at the Flatbush branch of the Brooklyn Public Library so, for me, this particular corner and this particular neighborhood has a lot of cultural significance but also, it’s very personally significant to me as well,” she said. The name CaribBeing came to be when Worrell was an undergraduate. “It was like a play on words,” she said. “We didn’t have a definition back then. The definition actually just came about in the last six months as we’ve just gotten deeper into our work but it was just something that I thought about back then and I didn’t know what it would be. I didn’t know that it would become a viable non-profit organization. As Brooklyn undergoes a transformation due to gentrification, ethnic communities such as Flatbush are changing rapidly. Worrell is confident that CaribBeing will continue to thrive. Gov. Andrew Cuomo and the Barclays Center announced Thursday that a Taste NY bar will be set up at the arena to sell beer, wine and spirits from all over New York State. Taste NY, which promotes New York State agriculture, would follow the arena’s existing Brooklyn Taste program, which offers the flavors of 55 Brooklyn restaurants, according to Brett Yormark, chief executive officer of Brooklyn Sports & Entertainment, which runs Barclays Center. “Taste NY is the perfect complement to our Brooklyn Taste program and furthers our commitment to sourcing from local producers,” he said. Assemb. 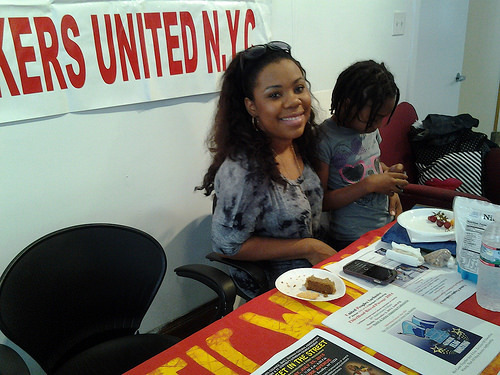 Latrice Monique Walker, D-Brooklyn, said the Taste NY bar will help to revitalize the state’s agricultural industry by stimulating demand for homegrown products. “This will help mobilize the upstate economy by buying from people right next door,” she said. Participating vendors include Neversink Spirits of Portchester, Bedell Cellars of Cutchogue, Orchard Hill Cider of New Hampton, the Bronx Brewery of the Bronx, Flagship Brewing of Staten Island, and Barrow’s Intense Ginger Liqueur, Brooklyn Wineries, Sixpoint Brewery, Red Hook Wineries, Van Brunt Stillhouse and NY Distilling Company Co., all of Brooklyn. “It’s a great opportunity to reach consumers who don’t normally see our products,” said Daric Schlesselman of Van Brunt Stillhouse, which has participated with Taste NY previously. Conor McCormack of Brooklyn Winery, who said his company had been part of Taste NY and wanted to become more involved. Josh Quinn,the Brooklyn sales manager n for the Bronx Brewery, said this was their the company’s first time participating with Taste NY and that it would absolutely continue. “It reminds people in Brooklyn that the Bronx is not that far away,” he joked when asked what it means for the brand to be affiliated with Barclays Center. Quinn said the Bronx Brewery is re-branding itself with a redesign of its cans, so “the time is perfect” to get more exposure for its products. Taste NY will be rotating the vendors in the Taste NY Bar. Mayor Bill de Blasio has given New Yorkers a bit more information regarding his proposed Brooklyn-Queens streetcar but has still not said whether there would be free transfers to buses and subways. The mayor has still yet to address one of the key points to the streetcar proposal: Will you be able to get a free transfer from the streetcar to an MTA bus or train? It’s a point that would “make or break” the deal for many New York commuters. “I’d still stay away, especially because of the lack of transfers. I have to cross multiple boroughs daily so if I use the streetcars and it doesn’t necessarily stop where I need to, it’ll just be wasting money for nothing,” said Alexis Rivera, a 20-year-old student from Jamaica, Queens. As I walked down Avenue J in Midwood toward the Tznius Princess shop, the women around me were dressed a lot differently than I was. Their skirts were below their knees, and some covered their hair with wigs. As I approached the wedding dress store in this Orthodox Jewish enclave, I became more and more nervous. I hoped that I, a Latina from Queens, wasn’t offending anyone by walking in dressed with a pair of black jeans. From the window display I could already tell that this wasn’t your average wedding dress store. The dresses had sleeves that covered the mannequin’s elbows; some even covered the mannequin’s wrists. They had beautiful detailing and extravagant ruffled skirts. As I rang the doorbell, I was relieved to see a warm welcoming smile just behind the glass door. When it comes to fashion, a religiously observant Jewish woman must evaluate her beliefs, morals, and values before deciding on how she should dress. The number of inches below the elbow or the knee, the cut, fabric and the colors will reflect how Jewish women balance religious and cultural factors with their sense of style. The result is a thriving trade of stores in the Midwood section, an Orthodox Jewish neighborhood not far from where I attend school at Brooklyn College. 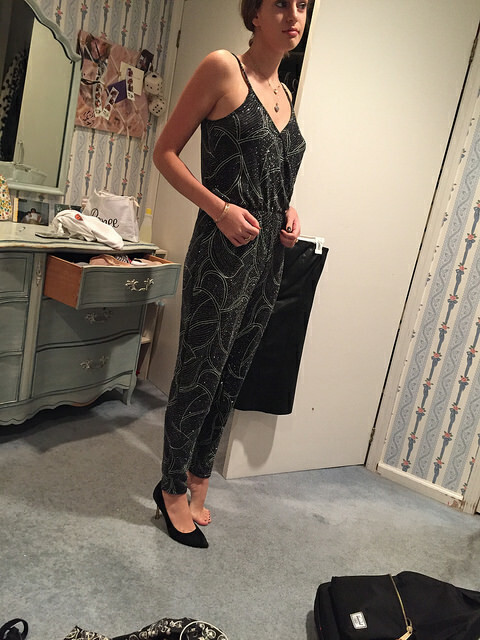 Stores specialize in clothing tailored for the tastes of local women. This means they are filled with skirts that pass the knees, blouses made to cover women’s collar bones, and even head scarves and wigs that married women wear to cover their hair, according to Jewish law. “There are different views in different Jewish groups as to the appropriate style of dress and the definition of modesty,” said Rabbi Elie Abadie of the Edmond J. Safra Synagogue on Manhattan’s Upper East Side. But, he said, there is one basic description of what is considered a modest way of dress. Abadie said that is found in the Code of Jewish Law that Rabbi Joseph Karo wrote in the 16th century. “The sleeves have to reach to the elbow inclusively, the length of the dress has to reach the knees inclusively, the neck area has to cover the clavicular bone, and the dress cannot be see through or very shapely and tight fit,” he said. Some ultra-Orthodox Jewish groups are a bit stricter and ask that women cover more of the body. The reason so much emphasis is placed on the way a woman should dress is that Jewish law demands it, according to Abadie. He says that it “demonstrates the character of a woman” and that it suggests a woman is humble; dressing this way allows a woman to show respect and value for herself. “In Judaism, women are not an object of desire, a toy or at the mercy of men’s passion. Therefore, they should not be used as sexual objects,” Abadie says. But, even though modesty in a Jewish woman is praised, Abadie believes that a woman should not be considered less religious if she does not dress this modestly. “A woman who does not dress very modestly may be a very pious woman in other areas, like in keeping kosher, respecting the Sabbath, keeping family purity laws, being charitable, taking care of the needy and poor, honesty and doer of acts of loving kindness,” says Abadie. Therefore religion should come from within. Inez Sharaby, a 21-year-old college student and newlywed who lives in Brooklyn, considers herself a religious Jewish woman but feels that she doesn’t have to dress in long skirts and blouses that cover her collar bones and elbows in order to prove how religious she really is. “I consider myself just as religious, since I pray, keep kosher, observe Shabbat and all the Jewish laws,” says Sharaby. Her religion is very important to her and she takes it very seriously. But being a young woman in the Jewish faith and keeping up with such a dress code can be difficult sometimes. Even I, as young woman, seem to still be trying to figure out who I am and trying to learn as much as I can about my culture and religion. So I can only imagine the pressure these women have from those around them like their parents, rabbis, and even friends..
Jill Mamiye, a 16-year-old high school student from Ocean Township in New Jersey, seems to have found the balance between her religion and the way that she dresses. For Mamiye, “clothing that doesn’t draw attention and that doesn’t show off my body” is what she considers appropriate. But this wasn’t always the case. When Mamiye was younger, jeans, shorts, and blouses that didn’t necessarily cover her elbows and collar bone were what she wore on a day-to-day basis. But now, because Mamiye has decided to dress according to Jewish law, she wears skirts that must go below her knees and blouses that do not reveal her elbows or collar bone. Her decision to dress traditionally was important for her because her family values and encourages it. But there wasn’t any pressure for her to make this decision, she said. “My family is supportive of any type of dress. They are happy I chose to dress modestly because I am happy.” Mamiye said she feels the freedom to choose what style of dress is best for her and her beliefs. She loves that her family is accepting of whatever choice she makes and also believes people shouldn’t judge others on how they dress. “It’s important that you value people not on the way they dress, but on the way they act,” Mamiye says. There is not only judgment inside the Jewish community, but also outside. Many Jewish women have faced discrimination just because of the way they dress, they say. Although sometimes dressing the way she does causes Mamiye to be judged by others, she reminds herself that this is important to her and her beliefs. Abadie says that although Jewish women are supposed to dress a certain way according to Jewish law, when entering public places, such as a gym, they must be aware, conscious, and respectful of the dress code of that institution. Yosefa Jalal, an Orthodox Jewish woman from Crown Heights, Brooklyn, was barred from working out in a gym because of her long skirt. Her membership at Lucille Roberts was revoked when she refused to leave because of how she was dressed. She was asked to leave because her attired did not meet the gym dress code, and when she didn’t she was continually harassed, threatened with arrest and eventually had her membership revoked, according to the New York Post. Such reactions sometimes lead Orthodox Jewish women to think twice about their attire. Beyda says the other, more conservative women stare at her and she can tell they are whispering things to each other about the way that she is dressed. As a single woman, I wondered if it was as hard for an Orthodox Jewish woman to find a husband as it is for any other woman. With religion being a big part of their lives and clothing important to their religion, I found myself questioning how the two affected each other. Finding a wedding dress that fits with the restrictions in Jewish law can be a little difficult. While Sharaby doesn’t dress traditionally on a day-to-day basis, she knew what type of dress was considered proper and she was able to pick one out that was appropriate enough but could still feel beautiful and comfortable in her decision. She told me the dress was strapless with a sweetheart neckline, with beautiful beading detail throughout the corset and a full princess tulle skirt. She did however tell me that, out of respect for her religion, she wore a cover up over her dress to cover her collarbones and elbows. The cover up was sheer with small beading details around the shoulders, elbows, and neck area. Polina Ruderman, owner of the Tznius Princess wedding dress shop on Avenue J, says that her store is fit for any Jewish woman looking for her perfect dress. An appropriate dress for a Jewish woman “covers the collar bone, covers elbows at least two to three inches, three to four inches below the knee, depending on how religious you are, and no see-through sleeves,” she told me. Ruderman’s store was opened with Torah-observant Jewish women in mind. All of Ruderman’s dresses are custom-made, which means that a bride coming into her store has no problem finding a dress. She says she can make anything a bride envisions. Ruderman was inspired to open this store because she felt that there weren’t many dress shops that catered to Orthodox Jewish women. Finding a wedding dress is tough for any woman, but with all the rules that observant Jewish women must follow, the process can seem much more difficult. In her youth, Gianna Mancini used to enjoy sledding in the municipal parking lot at the Junction in Brooklyn’s Flatbush section. It was mostly empty then, and there were fewer people walking through the shopping district. Different not only because of the influx of different retailers and different types of people within the community, but primarily because of the opening of the Triangle Junction – a shopping center that was built over the parking lot where Mancini once sledded. The area known as the Junction–the name stems from its history of being a transfer point for trolley lines–has seen dramatic changes over the past six years as more consumers travel there for their everyday shopping and dining needs. The Triangle Junction opened up in 2009, near the crossing of Flatbush and Nostrand avenues, housing what was then the largest Target in America. At a whopping 225,000 square feet, Target is undeniably the outlet’s anchor. Home Goods, The Children’s Place, David’s Bridal, Men’s Warehouse, Verizon, AT&T, Payless Shoe Source, and an Applebee’s moved in. Nike and Dallas BBQ opened nearby. It’s a dramatic change for a shopping district that had previously been home mainly to fast-food and West Indian takeout restaurants, bodegas, discount stores and greengrocers. The mall draws heavy foot traffic since the Junction is the last stop on two of Brooklyn’s most traveled subway lines, the 2 and the 5. Bus lines converge there, bringing passengers from southern Brooklyn neighborhoods that don’t have subway service. The Junction is also a block away from Brooklyn College, which has 16,000 students. Yet, with the introduction of larger chain restaurants and stores, residents fear that an area that they once called home will soon be unrecognizable. “The area is becoming really gentrified. I’ve lived here almost all of my life and it’s amazing to see the changes just within the last few years,” Mancini said. Many residents fear that the changes will resemble those which took place downtown with the construction of the Barclays Center, which opened in 2012. Flatbush residents have already seen rents go up sharply in the Midwood and Ditmas Park sections. At a November meeting of Community Board 14, which encompasses the Junction, concerns were expressed about apartment buildings potentially being built, with rents that would price out current residents. “The only way I would allow more apartment buildings to be built [in the area] is if I can ensure that my daughter would be able to afford it,” one resident said. Residents were also concerned about the design of some of these apartment buildings for fear that they would potentially “clash” with some of the more historic Victorian homes in the area. After 4 p.m. on a weekday you will see hundreds of people streaming the streets at the Junction: workers coming off the subway; adolescents and young adults coming from school. It is an opportunity for retailers to capitalize on. “Applebee’s is a good place to meet new people, because it’s such a busy place,” said Nikyra Singleton, 22, a senior at Brooklyn College. “I like Applebee’s for their cheap drinks. I go there every Tuesday after class.” Applebee’s, which doubles as a restaurant and sports bar, has many deals and specials to draw customers, including weekday happy hour that offers half-price drinks and appetizers. But although she enjoys the new businesses at the Junction, Singleton had reservations. In October, the Flatbush BID threw an event to help introduce the residents of the area to owners and workers at the various restaurants and stores located at the Junction. About 100 residents and students turned out to the event on Nostrand Avenue, near the Dallas BBQ. It seemed that the residents were in high spirits about the whole thing. “The BBQ’s here and it attracts a lot of customers . . . I think it’s [a] more positive change because at first nobody really wanted to be outside like that,” said Myrella Murray, 27, who attended the event. “Now my friends who live in other areas in Brooklyn call me to come out and have drinks at the Junction.” Murray also remarked that even in the year that she has lived in Flatbush, she has noticed a lot of changes and a lot of new stores coming in. Anna Sosa, a freelance independent contractor who works as the BID’s event planner and was formerly known as its merchandiser in residence, said this was the second event that she has done with the Flatbush Junction BID. Sosa, who has over nine years’ experience in corporate merchandising and event planning, expressed concerns and hopes for the future of the Junction. Many businesses get introduced to the area, but according to a few long-time employees at the Junction, not many of them stay. Fortunately this is not the case for Erin Santoli, 39, who has worked as a salesperson serving customers at Lord’s Bakery for the past decade. Lord’s Bakery is a family-owned bakery which has been serving sweets at the Junction for over 40 years. Santoli said rents increased at the Junction and that businesses come and go frequently. “Things change so quickly here, it’s sad, the rent has gone through the roof” for other business in the Junction, she said. Santoli expressed no worries about Lord’s business, saying it has loyal customers who have been coming to the bakery for decades. And a key factor is that the owner of the bakery owns its building. ”He’s not going anywhere,” said Santoli, who grew up in the area. Right outside of Lord’s Bakery, on any given weekday is Mohammed Rashid stationed with his fruit cart. Rashid, 58, has been selling fruit at that location since 2006. “The buildings change, everything changed, everything grow up,” Rashid said of the Junction. 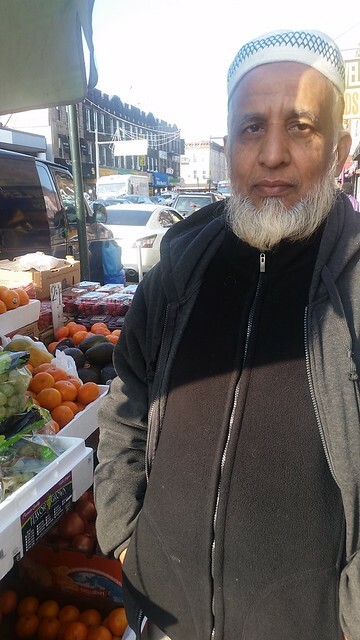 Rashid, who migrated to New York City from Bangladesh in 2001, started working for another fruit cart owner and now has his own. Rashid formerly had his fruit cart business in Manhattan, but decided to move his cart to Flatbush, because it was much closer to his home on Coney Island Avenue.What used to be two hours of commuting every day in his van is now a 10-minute drive, and he says he is sustaining his family-he has a wife and two sons–even better than he did in Manhattan. “Flatbush is good for me,” he said. The president of Brooklyn began the morning in a pair of swim trunks. Eric Adams was in the pool at St. Francis College in Brooklyn Heights to advocate safe swimming. His schedule for Sunday, Oct. 18 led him into a pair of sneakers as he joined hundreds of young athletes in a march across the Brooklyn Bridge calling for greater access to safe spaces for youth sports. He went to a community cookout where he wore a polo shirt and his signature smile. There was another change of clothing for an emergency hospital visit to encourage a dear friend fighting for his life and then a funeral to give a proclamation, honoring someone who had lost hers. It is for this reason, he said, that he keeps a suit and tie with casual pants in the car just in case he needs to speak on a last-minute panel or give a keynote speech at one of the many events happening in the busy borough of Brooklyn. Adams has become a genial and popular spokesman for Brooklyn, but no change of clothing can help him he walk the difficult line between encouraging the development that is reshaping Brooklyn – as his talkative predecessor Marty Markowitz did – and addressing the fear of gentrification that resounds among the black constituents whose support launched him to higher office. SEE: THE TALK OF BED-STUY: WHO IS A GENTRIFIER? Earlier this month the Brooklyn Borough Board joined boards in Queens, the Bronx, and Manhattan in voting against Mayor Bill de Blasio’s rezoning plans, which would allow higher-density development in many neighborhoods to encourage construction of affordable housing. Opponents say the housing envisioned under the plan say it isn’t really affordable and that it would contribute to the displacement that gentrification causes. Comptroller Scott Stringer issued a report asserting that the rezoning plan could displace as many as 50,000 residents of East New York. “By voting with our recommendations today, we’re saying ‘No’ to the city plan,” Adams said at the Brooklyn Borough Board meeting on Dec. 1. Adams sounded more pro-development in an interview with the Commercial Observer in March. “I think that East New York and Brownsville really offer some gems, if we just go and develop there. If we [met] infrastructure needs, we would see a great deal of development,” he said. Last year he released a report that targeted East New York, Broadway Junction, and Coney Island for development of affordable housing. The report recommended that 600 affordable housing units be built in the Broadway Junction area alone. Howell is the grandson of Brooklyn’s first black elected official, Bertram L. Baker, who won a seat in the Assembly in 1948 and was recognized as the borough’s black political boss. “For 30 years, black activists had been trying to get a black person elected to that office,” said Howell. Last year Howell organized a panel at Brooklyn College to discuss gentrification in Bedford-Stuyvesant. At this panel Alicia Boyd, founder of The Movement to Protect the People, spoke out against black elected officials, including the borough president. She said the black politicians weren’t protecting black residents from being driven out of their neighborhoods by the rising rents that gentrification is causing. As is the case for many of the city’s elected officials, Adams’ campaign fund relies heavily on real estate donors. The Commercial Observer reported that, “Those associated with the real estate industry made up more of Mr. Adams’ campaign donations of any other industry.” Shortly after becoming borough president Adams hired Anthony Lolli, a real estate executive, to be his adviser. Responding to questions raised about his loyalty to his black constituents, Adams says his diverse experience is what qualifies and prepares him to serve as president of such a diverse borough. Adams was born in the Brownsville section of Brooklyn on September 1, 1960. He was one of six children and as a boy, death and poverty were a part of everyday life. “It’s amazing how you could become so accustom to violence and conditions,” Adams said. He remembers making a game out of guessing who was shot the night before. The rodents were their “little pets and toys and projects.” He was in the third grade when his family moved to Jamaica, Queens, where he had a life-changing run-in with the police. As Adams recounted in an article he wrote for The New York Times last year, he was beaten by police officers when he was 15. He was arrested for minor crimes that night and taken to the basement of the 103rd Precinct where he endured repeated kicks to the groin. “Out of every part of my body, that’s what they targeted,” Adams wrote. He urinated blood for seven days after that. The group’s outspokenness encouraged the Vulcan Society, an association made up of African-American firefighters, to push harder for blacks to be hired in the Fire Department, according to Paul Washington, former president of the society. Washington said he mimicked Adams’ example with 100 Blacks in Law Enforcement Who Care. “They were just like us,” he said. He was inspired by the way Adams used the media and followed with a similar strategy to bring attention to discriminatory hiring practices within the Fire Department. The Vulcan Society won a lawsuit against the Fire Department, with a federal judge naming a monitor to oversee a new entrance exam and other hiring practices in the agency. Adams continued working his way up the ranks, becoming a police captain. He was elected to the State Senate in 2006. His district includes Brownsville, Crown Heights, East Flatbush, Park Slope, Prospect Heights, Prospect-Lefferts Gardens, South Slope, and Sunset Park. As a New York state senator Adams tackled issues such as the stop-and-frisk policy, illegal guns, and marriage equality (which he voted in favor of). As a legislator Adams was bold and outspoken. Back in 2012 he joined a group of senators and Assembly members who wore hoodies to the legislative chambers to protest of the death of Travyon Martin, a black teen shot to death by a neighborhood watchman in Florida. “I have a son; he looks like Trayvon,” Adams said during the demonstration. But Adams took his spot on a new stage when he was elected borough president a year later in 2013; his constituency was borough-wide, not from a heavily minority section of the borough. As a result, he has faced much criticism for his positions on development. His answer is that the diversity of this borough is what’s important. According to Adams, “Each change of attire also comes with a change of approach and knowledge of the people I’m communicating with. On a cold and windy Friday night in Brooklyn, about 140 18-to 35-year-olds piled into Christian Cultural Center’s young adult lecture hall to hear their pastor speak. The dimly lit room, styled similarly to a lounge with stadium-like seating, was ablaze with chatter. Pastor A.R. Bernard, founder of the East New York megachurch had gathered some of the millennials in his congregation to engage them in an open forum session titled “Real Talk – Millennials of Faith.” It was a meeting that, perhaps by chance, coincides with the release of the Pew Research Center’s latest statistics on the changing religious landscape in America that show that an increasing portion of the U.S. population is moving away from organized religion and now identifying as religious “none.” According to the findings, millennials are driving the growth of this group. “It is said that millennials are more accepting of the social changes in society. Is this also true of millennials of faith?” Bernard asked the group. “I don’t force my beliefs on anyone,” one young woman in the audience responded. “I live out my life according to the Bible, but I don’t go around preaching to people or pushing the Bible in their face or telling them their lifestyle is wrong.” Bernard nodded slowly as if contemplating her response. The group spent the next 90 minutes discussing a wide range of issues from racism to transsexuality and the struggle to maintain a Christian identity in an increasingly secular society. The religious “nones,” as the Pew Research Center labels them, includes both the “spiritual but religious” as well as those who self-identify as atheists and agnostics. While there are a number of reasons as to why the “nones” are growing, the authors of the center’s report say generational replacement plays a significant role. This is evident in the steady decline in the number of people who identify religion as important to their lives as the each new generation emerges. According to the Pew’s findings, two-thirds of adults in the generation born in the mid 1920s to early 1940s say religion is very important to them and they pray every day as opposed to 6 in 10 Baby Boomers and 5 in 10 Generation Xers. The millennials show far lower rates of religious involvement with just about four in ten saying religion is important to them. Seven in 10 of the youngest millennials born between 1990 and 1996 with no religious affiliation say religion is not important to them and 42 percent of them say they do not believe in God at all. Cornelius Sullivan, professor of sociology of religion at Brooklyn College, said he believes there are societal factors that are promoting this attitude. Citing societal reasons for his departure from church, Elston Wilson, 30, a college student majoring in accounting, said he grew up in a black Pentecostal church in Brooklyn and attended several times a week with his mother until his late teens. However, upon reaching adulthood, he began to question what he was taught about God. Brooklyn College social psychology Professor Curtis Hardin said religious identity is usually bound up in parental relationships and so people are generally more committed to religion to the degree that their parents share that same religious experience and is usually stronger depending on how attached they are to their parents. The Pew findings have consistently shown that generations usually become less religious as time goes by and this could mean America is moving toward becoming a more secular society. According to the numbers, the proportions of “nones” who say they do not believe in God has grown significantly. One-third of young adults who previously claimed to be spiritual but not religious now say they do not believe in God, an 11 percent point increase since 2007. Recognizing the shift from religion, Bernard told his group he is dedicated to creating stronger millennials of faith, who have a strong sense of identity and purpose and who will not run away from their faith when challenged. One of the ways he plans to accomplish this, he announced, is to convert one of the lecture halls into a black box theater, which will create a space for the young adults to hang out and have fun safely on the weekends. Laverne Washington browses carefully through the aisles of a variety store located on Fulton Street in Downtown Brooklyn. He gazes at natural potions, tonics, incense, afro-centric clothing and educational books. After speaking briefly with a sales associate he leaves with his purchase, Dr. Bronner’s Peppermint Soap. Washington and his family, who live on DeKalb Avenue, are no strangers to Nicholas Brooklyn Variety Store, having shopped there for almost a decade. In the past he has celebrated with Nicholas Brooklyn when his daughter, a published author, used the venue for her book signing event. But now the store is relocating from its home at 570 Fulton St. near Rockwell Place, one more business moving on because of the rising rents that have accompanied the redevelopment of the downtown area and construction of the Barclays Center. Stores like Nicholas Brooklyn Variety play an important role in the neighborhood’s culture, but they’ve had difficulty hanging on to their prime location. Monique Benjamin, who runs the store, said there is little choice. “Basically ever since they put up the Barclays Center that’s when people really started to notice the change in the area,” she said. The $4 billion Atlantic Yards Project included the massive basketball arena, Barclays Center, and also promised market rate and affordable housing that has yet to be built. As a response to developer Bruce Ratner’s plans, a coalition of over 51 community organizations came together in opposition to create Develop Don’t Destroy Brooklyn. Sandra Bell, a Dean Street homeowner who joined the coalition, said she has seen the changes affect residents and business owners with her own eyes. “I get letters everyday to sell this house,” said Bell. After fighting against the changes to the neighborhood that were causing her friends and neighbors to slowly be pushed out after the Barclays Center was built, Bell remains one of the last black homeowners on the block. “There are no provisions for the mom and pop businesses,” Bell added. The supporters of Nicholas Brooklyn believe they have already found a “center for urban life” in such stores. Nicholas Variety Store has been around since 1974 when founder Randolph Nicholas started making deliveries from the trunk of his car. He built connections and acquired a physical location in the Union Square area of Manhattan, where the store survived for 20 years – then he relocated to Harlem on 125th Street and Fifth Avenue, and eventually added a second location Downtown Brooklyn in 2006. Nicholas’ daughter, Monique Benjamin, followed in her father’s footsteps by running the Brooklyn location and transforming the store into what she calls “a place that changes people.” Providing jobs, giving opportunities to artists to showcase their talents, hosting community events, providing quality products and giving back to the people are all the ways Nicholas sets itself apart from big corporations and the chain stores that line Fulton Street. The building in which Nicholas is housed was purchased by developers Slate Property Group, Meadow partners, and an unknown third party for $23 million, according to The Real Deal, a New York real estate new site. The loss of Nicholas and other family-owned businesses affects more than just the flow of economy. “Everything will be very commercial. Everything is being affected by it,” said Benjamin. The store has found another home at Restoration Plaza in Bedford-Stuyvesant where it will be locked in for 10 years. The official move is set to take place before the end of the year. The building where Nicholas Brooklyn Variety Store is currently housed will most likely be turned into luxury condos by 2017, according to The Real Deal. A simuliar fate meets the property right next door on 66 Rockwell Place. And three more buildings just northwest at the intersection of Fulton Street, Dekalb Avenue and Flatbush Avenue, which was purchased by a real estate company called RedSky Capital for $24.4 million. With the many development projects taking place the coming years will bring an abundance of luxury apartments and pricey hotel rooms. But there won’t be anywhere to buy Dr. Bronner’s Peppermint Soap. “Eventually there won’t be anything here,” said Benjamin.